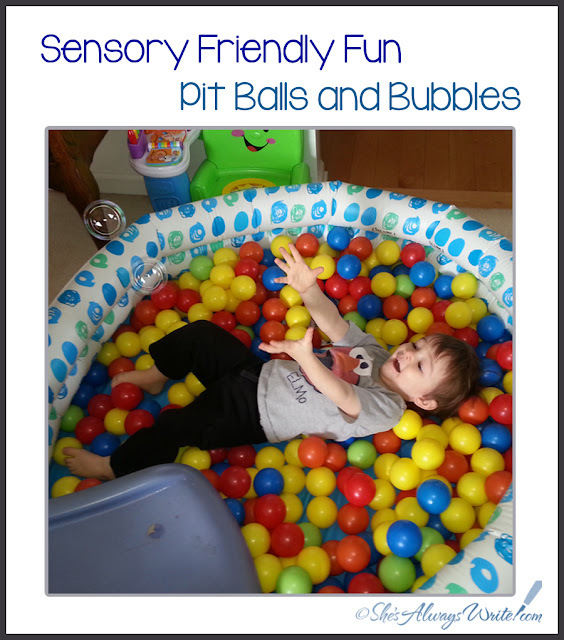 This post is a throwback to sensory activity ideas I saved because our EI therapists were geniuses but I was so busy being a mommy to small sensory seeking autistic humans that posting them at the time wasn't something I could prioritize. You'll be picking up balls forever. We also added one of those little plastic slides because it was there on account of garage sales are great. I can officially report it's toddler approved fun! My son's DT loved that we had the ball pit set up for indoor winter sensory input, and decided to incorporate it into his session. He loves it so much it was a great reward to motivate him through the session, and her addition of bubbles made him explode with joy. He asked us to do bubble balls endlessly for a while. Totally worth it. This activity is an extension of one I posted a while back when my older son was still small. If you're looking to make one yourself you can read about the wading pool ball pit situation here. And this one's an extension of my little guy just plain loved to be buried in balls and I was looking for ways to make that more engaging and maybe even a little educational - color matching pit balls with game spinners. I pinned this post to the Sensory Diet Activities section of my blog board. I shared it from my ShesAlwaysWrite Facebook page.